Founded in 2002, Kamus is one of the most prominent Nordic ensembles and continues to delight audiences with a strong and distinctive voice. In 2017 the quartet launched a new CD and toured around the world including to Mexico, UK, Belgium, Sweden and the Netherlands, including their celebrated Concertgebouw debut in Amsterdam. The new CD, which includes the world premiere recording of Esa-Pekka Salonen’s string quartet Homunculus won the EMMA-prize for the best classical music record in Finland 2018. It followed the acclaimed album Different Voices featuring Sibelius’s Voces Intimae, which was awarded the prize for best classical music album of 2016 by the Finnish National Broadcasting Company. Kamus was appointed as the artistic director of Our Festival in 2018, opening their tenure in summer 2019. An active force in Finnish musical life, Kamus has developed new ways of presenting chamber music with its acclaimed concert series TeemaHelsinki. 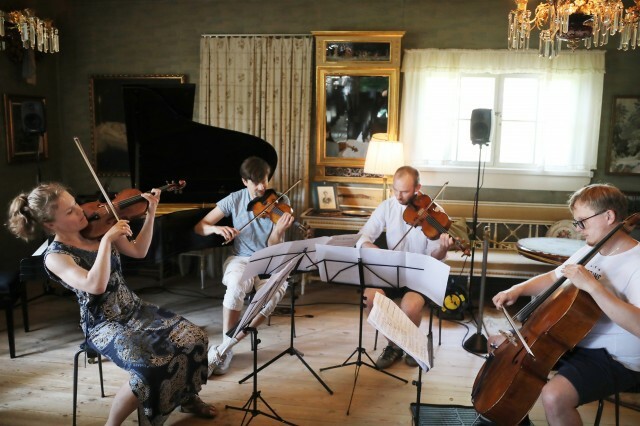 They have also launched a project that aims to enrich the musical life of rural parts of Finland. In fall 2017 Kamus curated on of Our Festival’s Breaking the Silence -tours.